Caroline of Ansbach, destined to become the Queen Consort of George II, was born on 1st March 1683 in the small German state of Ansbach, she was the daughter of John Frederick, Margrave of Brandenburg-Ansbach, and his second wife, Princess Eleonore Erdmuthe of Saxe-Eisenach. Her father died of smallpox at the age of 32, when Caroline was but three years old, after which she and her younger brother, Margrave William Frederick, left Ansbach with their mother, to return to her native Eisenach, where they lived in penury at Crailsheim. In 1692, her mother Princess Eleanore married Johann Georg IV, Elector of Saxony, after which she and her two children moved to the Saxon court at Dresden. The marriage, which proved to be an unhappy one for Eleonore lasted but two years when the Elector Johann Georg died of smallpox contracted from his mistress. Eleonore remained in Saxony until her death, two years later in 1696. Caroline and William Frederick returned to their native Ansbach to stay with their elder half-brother, Margrave George Frederick II. After which Caroline was sent to Lützenburg, near Berlin, where she was placed in the care of her new guardians, Frederick, Elector of Brandenburg, and his wife, Sophia Charlotte, who had been a friend of Eleonore. Sophia Carlotte, a woman of strong character, was the daughter of the Electress Sophia of Hanover, and the sister of George, Elector of Hanover, the future George I of England. Caroline's guardians became king and queen of Prussia in 1701, at the Prussian court, Caroline was exposed to an intellectual environment, in sharp contrast to her previous experience. Before her education commenced under Sophia Charlotte's guidance, Croline had received little formal education, and although her handwriting remained poor throughout her life, she developed into a scholar of considerable abilities. Caroline and her guardian became very close, when Sophia Charlotte died on a visit to Hanover in 1705, the young Caroline was grief stricken, writing to Leibniz, "The calamity has overwhelmed me with grief and sickness, and it is only the hope that I may soon follow her that consoles me". When the opportunity arose to become the wife of the future Charles VI, Holy Roman Emperor, Caroline turned it down because it would have meant renouncing her Protestant religion. In June 1705, Queen Sophia Charlotte's nephew, Prince George Augustus of Hanover, (pictured left) was under pressure to marry and produce an heir to the Hanoverian succession. Having recieved good reports of Caroline, he visited the Ansbach court to see her for himself. Caroline was an attractive and intelligent young woman and George is said to have immediately took a liking to her "good character", he was so impressed by Caroline that he "would not think of anybody else after her". Caroline also found her suitor attractive. The couple were married at in the palace chapel at Herrenhausen in Hanover on 22nd August 1705, Their first child, Prince Frederick of Hanover was born on 20th January 1707. A few months later, in July, Caroline fell seriously ill with smallpox which was followed by a bout of pneumonia. Although her baby was of necessity, kept away from her, George himself remained devotedly at her side and as a consequence, caught and survived the infection himself. Over the following seven years, Caroline gave birth to three more children, Anne, Amelia and Caroline. The aspirations of the Hanoverian family to succeed to the British throne remained insecure, as the British Queen Anne's Catholic half-brother, James Francis Edward Stuart, the son of James II, contested their claim and additionally, Queen Anne and George's grandmother, Electress Sophia (the daughter of Elizabeth Stuart) were not on good terms. 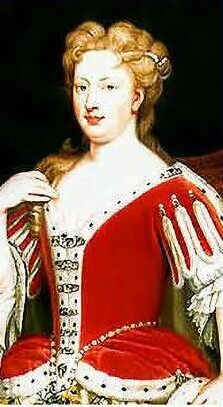 Queen Anne stoutly refused to allow for any of the Hanoverians to visit Britain in her lifetime. Caroline wrote to Leibniz, "I accept the comparison which you draw, though all too flattering, between me and Queen Elizabeth as a good omen. Like Elizabeth, the Electress's rights are denied her by a jealous sister [Queen Anne], and she will never be sure of the English crown until her accession to the throne." In June 1714, the Electress Sophia died at the age of 84, and Caroline's father-in-law became heir presumptive to Queen Anne. Her death was followed, just a few weeks later, by that of Queen Anne herself. Caroline's father in law, the Elector of Hanover, succeeded his second cousin Anne to the British throne as George I. George Augustus left for England in September 1714 and was followed by Caroline and two of her daughters in October of the same year. Their young son, Prince Frederick, remained in Hanover for the rest of George I's reign, as a figurehead to represent the Hanoverian family there, he was brought up by private tutors. Caroline's husband George was invested as Prince of Wales, making Caroline the first Princess of Wales for over two hundred years, (the last one being Catherine of Aragon, first wife of Henry VIII). In contrast to George I, George Augustus and Caroline, made an effort to acquire knowledge of England's language, people, politics and customs.The result was the development of two separate, rival courts, while King George I's consisted of his much favoured German courtiers and government ministers, the Wales's court attracted English nobles and was considerably more popular with the British people. Political opposition to the King gradually became centered around George Augustus and Caroline. Two years after their arrival in England, Caroline suffered a stillbirth, but the following year produced a second son, named Prince George William. At the baptism in November 1717, George Augustus quarreled with his father the king over the choice of godparents, the King had appointed the Duke of Newcastle, the Lord Chamberlain, the Prince, who had not been consulted and heartily disliked Newcastle proceeded to insult him at the christening, thereby angering his father, which led to the Prince and Princess of Wales being placed under house arrest at St. James's Palace. The couple moved into Leicester House, while, much to their resentment, their children remained in the care of the King. The considerable pressure of this made Caroline unwell and she fainted during a secret visit to her children made without the King's consent. By the following January, George I relented and allowed her access to her children. In February, when the young Prince George William fell ill, both George Augustus and Caroline were allowed to visit him at Kensington Palace without any conditions, sadly, the child died. Over the next few years, Caroline produced three more children, William, (who later became Duke of Cumberland and led the Hanoverian forces at Culloden against Bonnie Prince Charlie) Mary and Louise, all of whom were born in England. Caroline struck up a friendship with the politician Sir Robert Walpole, who attempted to engineer a reconciliation between the King and her husband for the sake of public unity. Caroline wished to regain custody of her three eldest daughters, who still remained in King's care, and thought the reconciliation would inevitably lead to their return, but sadly, negotiations were unsuccessful. George Augustus strongly felt that Walpole had tricked him into the reconciliation as part of a scheme to gain power. The prince became isolated politically when Walpole's Whigs joined the government. Caroline's intellectual abilities far outshone those of her rather dull husband, she was an avid reader and established an extensive library at St. James's Palace. She helped to popularise the practice of variolation, an early form of immunisation. At Caroline's instigation, six convicts were offered the chance to undergo variolation instead of execution, all survived, as did six orphan children given the same treatment as a further test. Caroline had her children Amelia, Caroline and Frederick inoculated against smallpox in the same manner. George I died in 1727 and Caroline and her husband were duly crowned at Westminster Abbey on 11 October that year. She remained a steadying influence on her husband, although King George II, still bitter, frequently referred to Walpole as a "rogue and rascal" over the terms of the reconciliation with his father, the more sensible Caroline advised her husband to retain Walpole as his leading minister. Walpole commanded a substantial majority in Parliament and George was presented with little choice but to accept him and swallow his pride rather than risk ministerial instability. During the following ten years, Caroline exercised immense influence. She tactfully persuaded the King to adopt policies at the behest of Walpole, and advised Walpole against taking inflammatory actions. Having absorbed the liberal opinions of her mentor, Queen Sophia Charlotte of Prussia, Caroline supported clemency for supporters of the rival Jacobite claim to the throne, freedom of the press, and freedom of speech in Parliament. Hervey's memoirs recall:-" The queen loved reading, and the conversation of men of wit and learning. But she dared not indulge herself so much as she wished to do in this pleasure for fear of the king, who often rebuked her for dabbling in all that lettered nonsense, as he called it." Although George always had mistresses he remained devoted to her. Over the following few years, Caroline and her husband were in constant conflict with their eldest son, Frederick, Prince of Wales, who had remained in Hanover when they came to England. 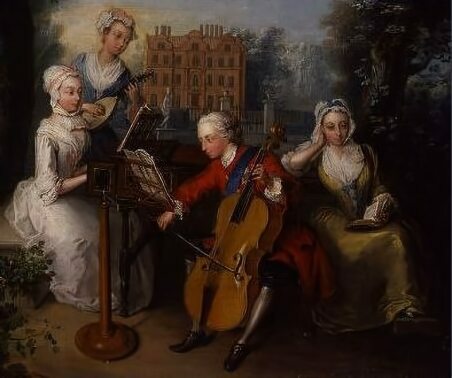 Frederick rejoined his family in 1728, soon after the death of George I, by this time he grown to adulthood, had mistresses and had aquired large debts, Frederick was fond of gambling and practical jokes. Much to the dismay of his parents, he opposed his father's political beliefs, and complained of his lack of influence in government. The Regency Act of 1728 which appointed Caroline, not his heir Frederick, as regent, when George II visited Hanover for five months from May 1729, served to make relations between mother and son worse. The King's frequent absences abroad tended to make him unpopular, and in late 1736, in attempting to return to England, the ship he was travelling on was caught in a storm, leading to rumours spreading that that the king had been lost at sea. The devasted Caroline was appalled by the insensitivity of their son, who much to her annoyance, hosted a great dinner at the time. 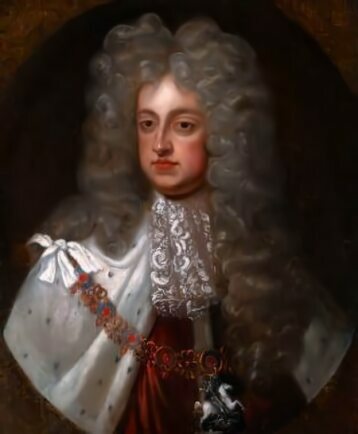 During Caroline's regency, Prince Frederick instigated attempts to make quarrels with his increasingly embittered mother, whom he viewed as a means to irritate his detested father. Repeating a pattern that was to echo in the Hanoverian family, Frederick became a focus for the opposition. He made an unsuccessful application to Parliament for an increased financial allowance that had hitherto been denied him by his father, public disagreement over the money succeeded in widening the divide between Frederick and his increasingly irritated parents. On the advice of Walpole, who took on the role of mediator, Frederick's allowance was raised, but by less than the sum he had requested. In June 1737, Frederick informed his parents that his wife, Augusta of Saxe-Gotha, was pregnant, and that the child was due in October. Augusta's due date was actually earlier and an unsavoury episode followed in July in which the prince, on discovering that his wife's labour had commenced, sneaked her out of Hampton Court Palace in the middle of the night, to ensure that his parents could not be present at the birth. George and Caroline were both horrified by his actions. By tradition, royal births were witnessed by members of the royal family and senior courtiers to guard against supposititious children, and the unfortunate Augusta had been forced to ride in a rattling carriage for an hour and a half while heavily pregnant and in much pain. Accompanied by two of her daughters and Lord Hervey, the Queen hurried to St. James's Palace, where Frederick had taken Augusta. Caroline was relieved to discover that Augusta had given birth to a girl. The circumstances of the birth served to deepen the estrangement between mother and son. According to Lord Hervey, Caroline once remarked after seeing her eldest son, "Look, there he goes-that wretch!-that villain!-I wish the ground would open this moment and sink the monster to the lowest hole in hell!" Following the birth of her last child, Princess Louisa, in 1724, the Queen developed a hernia, which went untreated. Eventually, in 1737, surgery became neccessary. The operation was carried out without the use of anaesthetic, the queen was reported to have borne the pain bravely. Although the operation itself was successful, gangrene set in and as Queen Caroline lay dying, she urged her husband to marry again, he is said to have replied "No, no!... I shall have mistresses instead". The King refused Frederick's request to see his mother, although Caroline complied with his decision she sent her son a message of forgiveness through Walpole. Queen Caroline died on 1 December 1737. George II who slept in a cot by her bed during her final illness, was reported to be devastated at her loss. She was buried at Westminster Abbey on 17 December, the Prince of Wales was not invited to the funeral.